Today I am excited to introduce you to Jennifer from Mother Thyme. Not only does Jennifer have TWIN kiddos who are almost two (I can barely keep up with one! ), but she also keeps up a beautiful food blog and is starting to integrate posts about home and crafts. Twins + gorgeous food blog + crafts = superwoman. Would you like to escape to the tropics for breakfast today? 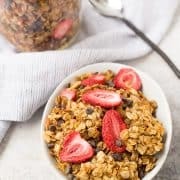 Maybe we all can’t hop on a plane to go to an exotic island with palm trees filled with fresh coconuts but whipping a coconut inspired pancake recipe in the kitchen and setting a theme of a tropical breakfast can be just as good. Being a mom of almost two year old twins that choose to still eat with their hands most of the time instead of forks, I often make a batch of warm, fluffy pancakes for breakfast. My variations of pancake recipes continues to grow and I look forward to gathering more tasty pancake recipes to try during the pancake party. These have become of morning favorite in our house. Then again, anything coconut is a favorite of mine. What I usually do with this recipe or any pancake recipe for that matter is double it to make a batch to freeze. Nothing beats grabbing a few pancakes out of the freezer on a busy morning to warm and serve. 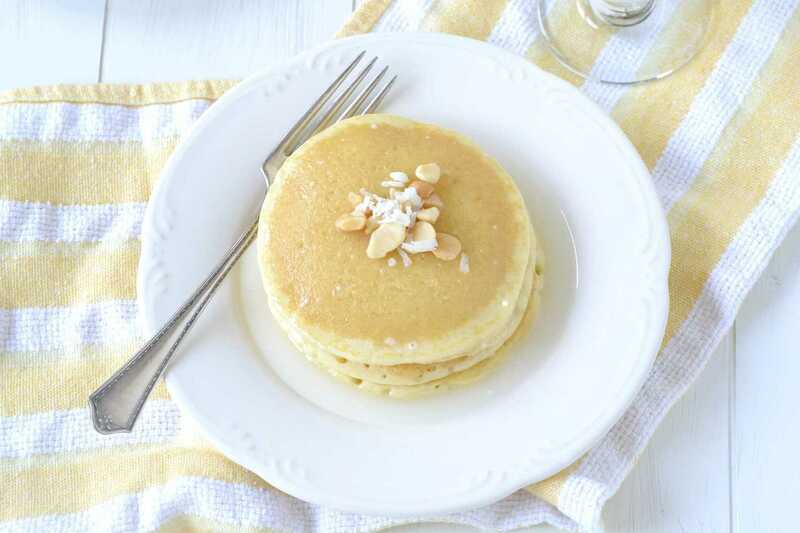 These coconut-lemon pancakes are drizzled with coconut syrup and topped with chopped macadamia nuts. 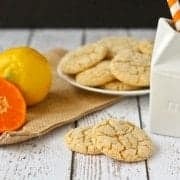 They include a burst of fresh citrus combined with coconut extract along with sweetened coconut flakes. 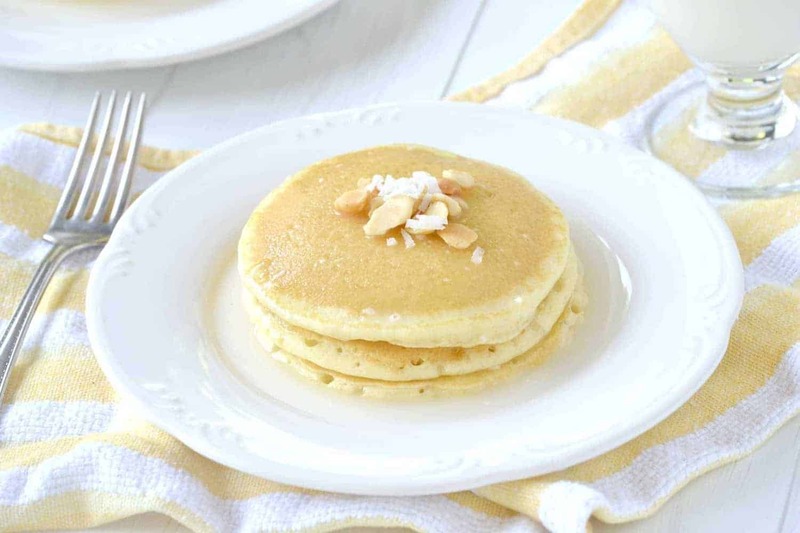 Waking up to a warm batch of these pancakes would be perfect for any summer morning or Saturday brunch by the pool. If you can’t find coconut syrup or if your parents didn’t just come back from vacationing in Hawaii and brought you back a bottle I have a solution for you. Combine confectioners sugar with water and a coconut extract. Sure it will be more like a coconut glaze than syrup but it works as a good substitute to get that full coconut flavor. The other option is grabbing a bottle of this insanely good syrup on Amazon because if you love coconut as much as I do you’ll want this on your stack of pancakes among other things. Complete the tropical theme breakfast or brunch with a side of fresh pineapple slices and papaya-mango juice for a fun tropical inspired breakfast. Thank you Rachel for inviting me to your awesome pancake party! In a large mixing bowl combine flour, coconut flakes, sugar, baking powder and salt. Stir and make a well in the center of flour mixture. Add in milk, lemon juice, butter, egg, lemon zest and coconut extract. Stir together until blended. Spray a skillet with nonstick cooking spray and preheat over medium heat. Pour desired amount of batter into skillet and cook until top begins to bubble. Flip with spatula and continue to cook until cooked, about 3 minutes per side. Serve warm with coconut syrup. 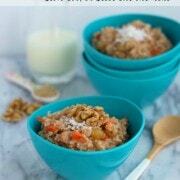 In a small bowl combine confectioners sugar, water and coconut extract. Stir until confectioners sugar is dissolved. Add more water if needed. Drizzle over pancakes. I could use a little trip to the tropics right about now. Thanks for sharing, Jennifer! You can also find Jennifer on Facebook, Twitter, and Pinterest. My youngest loves coconut and pancakes. I can’t wait to surprise him. 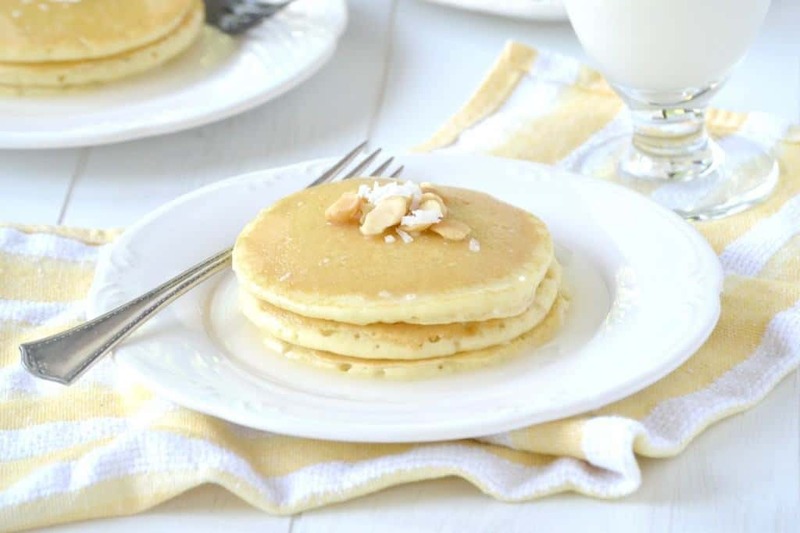 I never thought to put coconut into pancakes but it sounds so yummy, the husband would love it. Thanks again for having me here today and for such kind words! 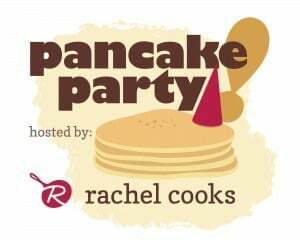 My pancake recipe index is getting filled with so many delicious new recipes to try thanks to your pancake party! I adore Jennifer and these pancakes are an example of why. They sound amazing, so summery and refreshing! I’ve never had a tropical pancake before but this sounds really good. Beautiful photos too!